In Maryland, you must take a basic EMT course and then pass the NREMT practical and cognitive exam. With passing the exam you will receive a certificate that is necessary for a license in the state. Is there an age requirement to become an EMT in Maryland? Yes, individuals must be 18 years old to enroll in EMT certification. You must also have a high school diploma or GED to become an EMT. Side Note: Once you're EMT certified, your training isn't over. In addition to on the job training, you're required to take a refresher course every 2 years to keep your certification up to date. It's important to take these re-certification programs not just because they're mandatory but because healthcare is constantly evolving and you will be learning the latest practices and techniques to stay educated. Do I need to be CPR certified prior to EMT training? This depends on the program. Some will require you already enter with a CPR certification, while others will include that in the course training. What are the levels of EMT? Each level has different requirements and more advanced capabilities than the one before. How long will it take me to complete basic EMT training? Training can take anywhere from two years to six months. This will depend on the institution/program you choose and timing available to do so. There is typically between 120 to 150 hours of coursework. Enrolling in EMT training online is an option for people with busy schedules. It’s best to find the right education provider for you and lifestyle. What colleges provide EMT education in Maryland? What is an average salary for an EMT in Maryland? An average is $36,000 per year. However, salaries can vary depending on your certifications, experience, and education. Once you're an EMT basic, it's beneficial to continue building your skill set with additional training and education. Your career path only opens from here so set a career goal and go for it. 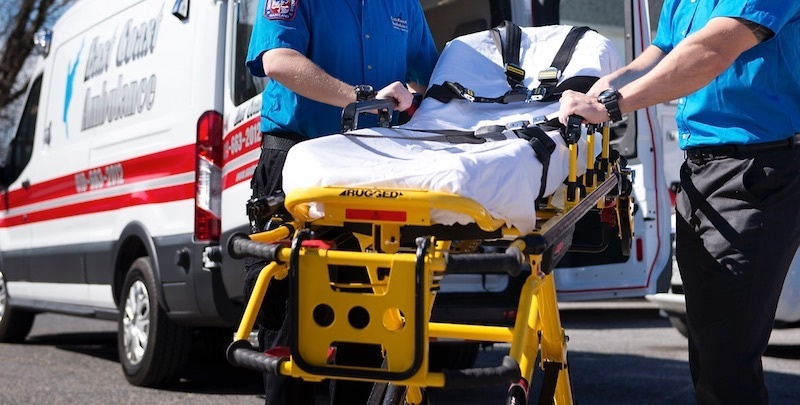 Complete Advanced EMT Training or become a Paramedic. Finish a Two-Year Degree Program. Earning an Associates Degree can help fuel your career long term. If you're hesitant to go to a four year college, start smaller with a local community college. These colleges will save you $$ long-term, since they're more affordable compared to universities. Since you're likely going to be taking general courses at community college, you'll have the credits available to transfer to a four year college, with 2 years already completed, if you decide to do so. An associates degree will provide more opportunities for advancement and transferring to other divisions or internal roles within healthcare institutions. An Associates Degree in Nursing can guide you long term in the healthcare field. Finish a Four-Year Degree Program and consider Nursing School. Obtaining your Bachelor's degree can open new avenues into healthcare careers. Enrolling in Nursing school can be the right move for many because a career in nursing comes with plenty of job security. A four year degree can also help to transition your role to management or the back-end of Healthcare as a business. Finish a Master's Program and get your PHD. It may be too far down the road for you to think about just as you're starting as an EMT but if you're passion is for healthcare and helping patients, becoming a doctor or licensed practitioner is often the holy grail in achievements for a lot of students. Your EMT training is just the tip of the iceberg when it comes to your career opportunities. Continue your education and push to get more out of it.